Forking out for school uniform and new shoes over the summer can be a little expensive so you may want to think about having a #HolidayatHome with Carpetright! There is no need to pack your bag and catch a flight abroad or spend money on local attractions to have a good time with the family this August, you can have lots of fun without passing your front door for a fraction of the cost. Whether you want to build a cardboard castle or a furniture fort, getting creative and making a hideout with the kids is really entertaining. Sneak in some snacks and pop on a movie too to enjoy. Rummage through the kitchen and grab your baking essentials to whisk up some treats. We have been making Two Tone Biscuits, Madeira Cake and a few other delicious goodies this week, the ingredients for which were all found in the fridge and cupboards already. Dining al fresco and setting some toys up in the garden changes the atmosphere a little and keeps the kids busy. While they potter around wearing themselves out you may even be able to work on your tan and catch up on some reading. Using up old cardboard tubes, milk cartons and egg boxes is a great way to teach the kids about the importance of recycling while letting their imaginations run wild. Why not try making bird feeders or other animal inspired crafts like our owls, ladybirds and stone pets. Carpetright want to make this your best summer yet and one lucky winner will receive a Champneys Spa Day worth over £400 and a luxury hamper from British Fine Foods containing a selection of gourmet treats. Two runners up will also have the chance of winning a hamper too. To enter you just need to share your #HolidayatHome photo on social media, with the hashtag, and enter the link of the image on the website here. What fun activities have you been enjoying at home this summer? There is some really great ideas here! I love baking with my niece, however it can get a little messy! Hey great ideas there especially the bird feeders. We love watching tge different varieties of birds in the garden at nanny's house. We've had a lot of fun at home this summer, it's nice to just chill out sometimes. It's so easy when you are a SAHM to forget the really obvious things you can do with the children for play. The items in front of you are least used, there seems to be this pressure to constantly be turning to Pinterest creativity. This is a great list, thank you for being the simplicity back. Brilliant ideas. My kids loved baking during the holidays, we made everything from rice crispy cakes and victoria sponges to bread and baguettes. Stacey's been teaching Oscar how to make a den this week and he absolutely loves it.The only problem is, we lose them for hours while they're in there! Fab idea and what a great competition! This sounds like a fantastic competition! We have done lots at home this summer, hoping to enter this competition! I watched a TV program and the family camped put in the garden and thought it was great. You don't always have to spend to have fun. Some great ideas here - love the bird feeder one. We've tried to do lots of crafts this holiday but we have been so buys it has been hard to get it all in! It's always nice to have a holiday at home, loving all the suggestions I think for me baking would be it and building castles. 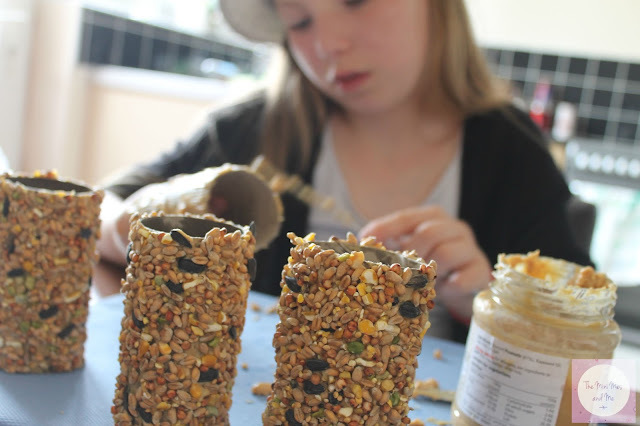 Love the toilet roll bird feeders fab idea! We love at home holidays. It's always good to make the most of what you have locally. Love the bird feeders! May have to make some for Nanny's garden! Those bird feeders are fantastic! Sounds like you've been having lots of fun over the holidays. We had POD finish pre-school recently and she starts school next week - eek! The bird feeders are ace , this is a project they'd love at school. Ooh I love those bird feeders. Such a good idea.